FORT WORTH, Texas (Feb. 2, 2018) – The Davey O’Brien Foundation has announced that Ron Jaworski has been named this year’s recipient of the Davey O’Brien Legends Award. Jaworski will be honored alongside National Quarterback Award winner Baker Mayfield at the 41st Annual Davey O’Brien Awards Dinner. Jaworski spent 17 seasons in the National Football League after being selected by the Los Angeles Rams in the 2nd round (37th overall) of the 1973 NFL Draft. He played for the Rams (1973-76), Philadelphia Eagles (1977-86), Miami Dolphins (1987-88) and Kansas City Chiefs (1989). In 1980, Jaworski was named the Bert Bell Award winner as the NFL’s top player, and also earned NFC Player of the Year, UPI NFL Player of the Year and All-Pro honors. He led Philadelphia to a 12-4 regular season record and the NFC Championship. The Eagles’ appearance in Super Bowl XV was the first in franchise history. The native of Lackawanna, N.Y., enjoyed his best season in 1980, throwing for 3,529 yards and 27 touchdowns (257-of-451 passing). For his career, Jaworski was 2,187-of-4,117 passing for 28,190 yards and 179 touchdowns. 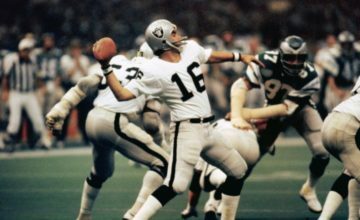 At the time of his retirement, he held the all-time record for consecutive starts by a quarterback with 116, a figure that now ranks seventh. As a collegiate quarterback, Jaworski starred at Youngstown State University from 1969-72. During his time, he completed 325 passes for 4,612 yards and 32 touchdowns. He was inducted into the YSU Sports Hall of Fame in 1986. From 1990-2017, Jaworski served as an NFL analyst on ESPN, working on such broadcasts as Sunday NFL Countdown, NFL Matchup and Monday Night Football. He currently is the CEO of Ron Jaworski Golf Management, Inc., and is a part owner of the Philadelphia Soul of the Arena Football League. His foundation, the Jaws Youth Playbook, improves the overall health and wellness of at-risk youth. He was honored with the Volunteer Leadership Award, the United Way’s highest honor, in 1998. In 1997, he received the Eagles’ Bert Bell Man of the Year Award, given to a person who contributed significantly to the NFL. 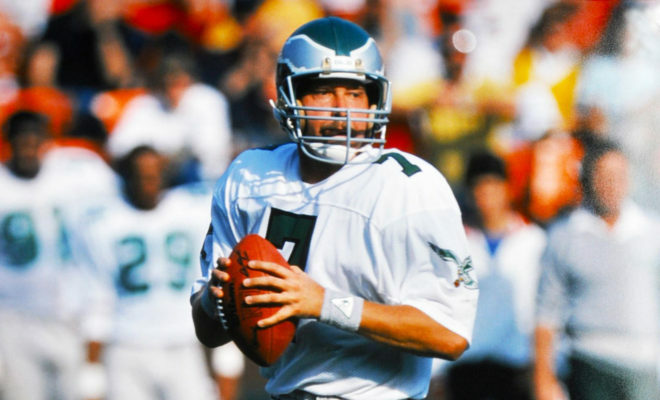 In 1992, Jaworski was inducted into the Philadelphia Eagles Honor Roll. Both Jaworski and O’Brien have strong ties to the Eagles and Bell, the team’s owner and coach in the 1930s. O’Brien was drafted by Bell’s Philadelphia team in 1939, was signed to the NFL’s largest contract at the time and became a two-time All-Pro before retiring to join the FBI following the 1940 season. 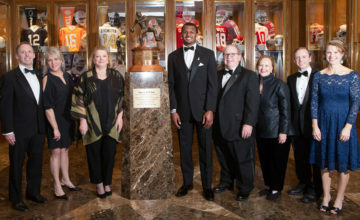 The Davey O’Brien Legends Award was established in 2001 to commemorate the 25th anniversary of the foundation by recognizing a quarterback who has made significant contributions to the game of football on and off the field. 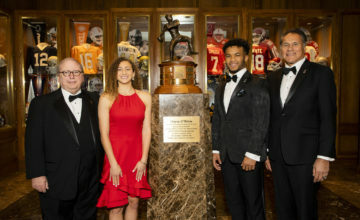 Mayfield, Jaworski and Davey O’Brien High School Scholarship winner Mikayla Wilson will be honored at the 41st Annual Davey O’Brien Awards Dinner at the Fort Worth Club on Monday, Feb. 19. A limited number of individual tickets are available in the Sunset Room for $200 each, a portion of which is tax deductible. Please contact the Davey O’Brien Foundation at (817) 338-3488 for more information.